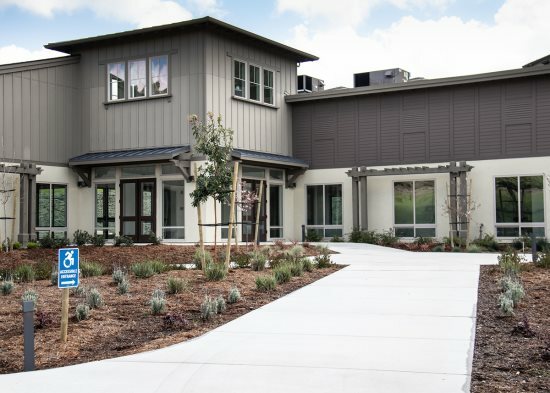 The Orinda City Council voted 4-1 to accept the newly completed Art and Garden Center at Wilder at its March 19 meeting. Mayor Inga Miller, who pulled the measure from the consent calendar so that it could be discussed, voted no, owing to her concerns about accepting the building with the access issue being unresolved. Although the center has sufficient parking in the lot shared with the Wilder play fields, and an ADA accessible ramp from that parking lot, the problem is that access to the rear of the center is currently limited to emergency vehicles only, leaving the handicapped to navigate an ADA-compliant, but quite long, ramp up from the play fields parking lot. Deliveries of catering supplies for events at the center might also need to be brought up from this parking lot, although Director of Parks and Recreation Todd Trimble told the council that the emergency vehicle access can be used for deliveries as well as for emergency vehicles. The original plan for the center was for it to be located at the end of Wilder Road, the one public road in the Wilder Development, but starting in 2014 the plan was changed to bring the building up to the front of the valley, adjacent to the play fields. When the location was changed, no provision was made for access over the short length of Bigleaf Road from Wilder Road to the beginning of the driveway that leads to the rear entrance of the center. Currently, there are six approved parking spaces behind the center, but no legal access to them for the general public, although they could be used by Wilder residents. Additionally, the city would like to add another parking lot, providing 25 regular parking spaces as well as one for the handicapped. The developer, OG Property Owner LLC, is offering the city an access easement over Bigleaf Road. However, residents of Wilder submitted written comments on the measure, asking that the council delay consideration of the access easement. 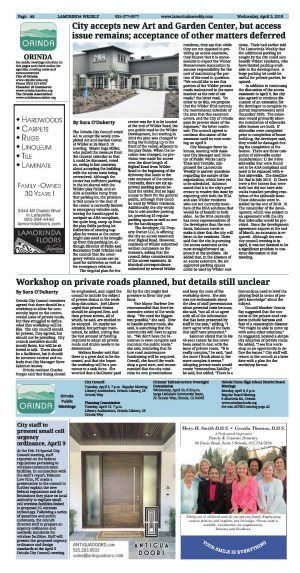 In identical correspondence submitted by several Wilder residents, they say that while they are not opposed to providing an access easement, they believe that it is unreasonable to expect the Wilder Homeowners Association to assume responsibility for the cost of maintaining the portion of the road in question. "We would like to see this portion of the Wilder private roads maintained in the same manner as the rest of our roads," the letter read. "In order to do this, we propose that the Wilder HOA controls the maintenance schedule of the area that this easement covers, and the City of Orinda pays its prorate share of the expenses," the letter continued. The council agreed to continue discussion of the easement until its next meeting on April 9. City Manager Steve Salomon, meeting with Assistant City Manager and Director of Public Works Larry Theis and Trimble, telephoned the Lamorinda Weekly to answer questions regarding the nature of the negotiations, which have yet to be scheduled. Salomon stated that it is the city's preference to resolve this issue by exploring with both the HOA and also Wilder residents who are not currently members of the HOA solutions that would be of benefit to both sides. As the HOA currently has more representatives of the developers than the residents, Salomon wants to make it clear that the city will listen to the residents. Theis said that the city is pursuing the access easement as the most straightforward approach to the problem. He added that, in the absence of an access easement, the six approved parking spaces could be used by Wilder residents. Theis had earlier told The Lamorinda Weekly that the additional parking lot sought by the city could also benefit Wilder residents, who have limited parking available in the development. A large parking lot could be useful for private parties, he opined. In addition to continuing the discussion of the access easement to April 9, the city also agreed to continue discussion of an extension for the developer to complete required improvements until December 2020. The extension would primarily allow the installation of sidewalks after houses are built. If sidewalks were completed prior to completion of home building, the developer said, they would be damaged during the completion of the homes. There are three categories of sidewalks under consideration: 1) the 3-foot sidewalks that were found not to be ADA compliant and need to be replaced with 4-foot sidewalks. The deadline for that is July 2019. 2) There were a few homes that were built but did not have sidewalks installed pending resolution of the sidewalk issue. Those sidewalks were installed by the end of 2018. 3) The remainder of the development, which was subject to an agreement with the city that sidewalks would be provided. Since the development agreement expires at the end of March, an extension is required. Although the next city council meeting is in April, it was not deemed to be a significant problem to continue discussion to that meeting.